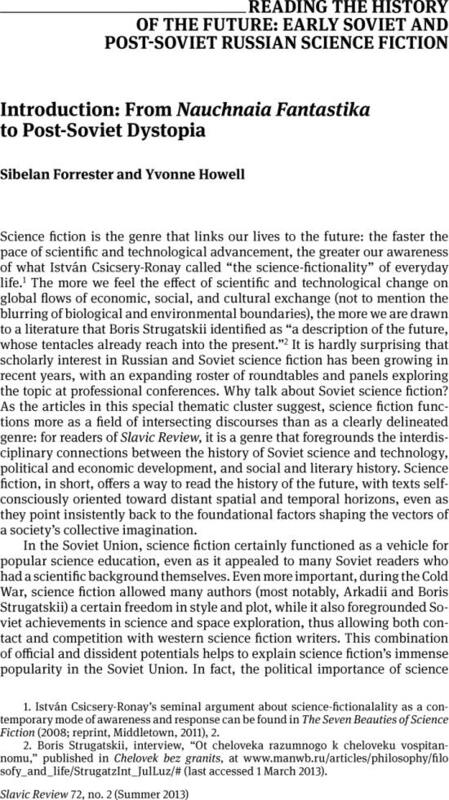 za pomocą JSTOR: Slavic Review, Vol. 72, No. 2 (SUMMER 2013), pp. 224-246. Based on a detailed analysis of published and unpublished sources, Matthias Schwartz reconstructs the making of Soviet science fiction in the cultural context of Soviet literary politics. Beginning in the 1920s, nauchnaia fantastika (scientific fantasy) became one of the most popular forms of light fiction, though literary critics and activists tended to dismiss it because of its origins in popular adventure, its ties to the so-called Pinkerton literature, and its ambiguous relationship to scientific inventions and social progress. Schwartz’s analysis shows that even during high Stalinism, socialist realism’s norms were far from being firmly established, but in the case of nauchnaia fantastika had to be constantly negotiated and reconstituted as fragile compromises involving different interest groups (literary politicians, writers, publishers, readers). 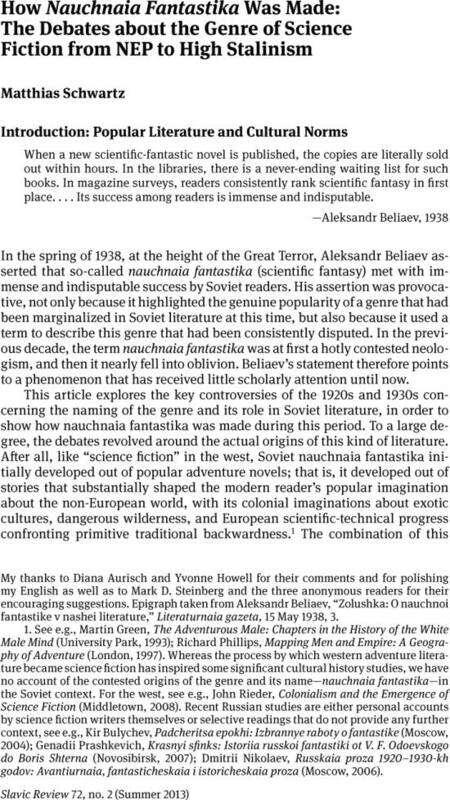 A cultural history of Soviet science fiction also contributes to a better understanding of what people actually wanted to read and sheds new light on the question of how popular literature adapts to political changes and social destabilizations.